Always one who is seeking information and inspiration, I recently asked some Facebook friends and followers of Cowgirl Granola (where I also share what goes on in The Cowgirl Gourmet kitchen) what they wanted to see more of on this blog. The answers ranged from gluten-free sides, salad entrees, healthy summer dishes and low carb desserts to no-cook meals and low sodium grilling sauces. These ideas have been percolating, trust me, but launching a new farmers market took precedence. Now that I am finding a little more balance in-the-world-of-two-farmers-markets-a-week, I am starting to get back in the kitchen and cook. Because summer has officially hit San Antonio and across the country (it was 98 in New York the other day), I am responding to your requests with a trifecta–a no-cook, gluten-free and healthy dish with lots of possibilities. You may recall that I am gaga for gazpacho. It’s one of my favorite things to make in the summer. I love that it uses only the freshest farmers market ingredients. I love that there is absolutely no cooking involved (but it does taste better the next day, so plan ahead). I love that it is an unbelievably fantastic dish–no matter whether you serve it as an appetizer, soup or entree–and one that is gobbled up with equal gusto by both omnivores and vegetarians. This time, I wanted something a bit different, but was unsure exactly how to switch it up. 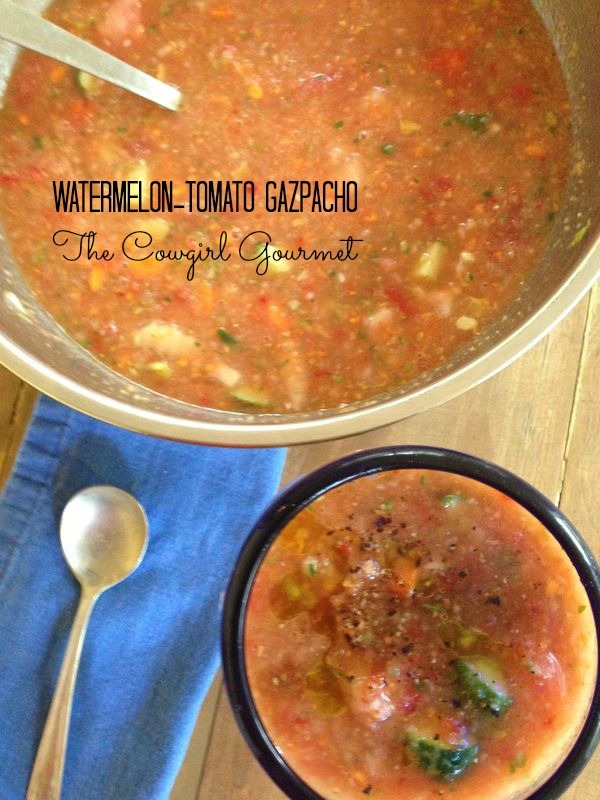 When I saw the watermelon and yellow and red tomatoes mingling together on the kitchen counter, I immediately thought of combining the two–tomatoes and watermelon–for a gloriously refreshing gazpacho with just a touch of sweetness and plenty of texture. Then when I ran over to Whole Foods in the morning, they had made a watermelon gazpacho and were sampling it. I knew this was a sign and so I picked up a container to support the confluence of energy speaking to me. And to reward myself for listening! This recipe is far from traditional and I especially like that. Instead of tomato juice, it’s just the juices released from all of the fruit and vegetables that makes it “soupy.” Use a handful of whatever fresh herbs you want–chives, parsley, mint or cilantro–or be a naturalist and serve it as is. It is summer in a bowl. Or in a mug. Or serve it in a wine glass for a more playful approach. It’s delicious, fresh and totally good for you! No matter how you define summer, you will certainly want to keep this twist on gazpacho in your recipe repertoire. If you love gazpacho, you are going to flip for this summery combination of watermelon and tomatoes! Loaded with fresh vegetables, the textures and flavors meld together to make an amazingly refreshing summer dish. Whether you serve it as an appetizer, soup or as a light entree with a salad, it is a lovely way to celebrate (and survive) the heat. If your people must have some protein with their meal, add some boiled shrimp to the gazpacho for a heartier appetite. Fill a pot with water and place over high heat on the cooktop. While the water starts to boil, get all of your ingredients together and get ready to slice, dice and chop. Start by making an X on the bottom of each tomato. This will help the skin peel right off after you blanch them. Next, find the biggest bowl you have for this recipe. It makes a lot and the juices form the vegetables will extract, so be sure your mixing bowl is big enough. Also, get another bowl and fill it with ice and cold water--this will be the ice bath you use after you blanch the tomatoes. Now, you can start chopping your vegetables--cucumbers, watermelon, celery, carrots, bell pepper, shallot, onion, elephant garlic, jalapeno. Check on the water and if it is boiling, use a slotted spoon to carefully place the tomatoes in the pot. After 30 seconds, remove the tomato from the water and place in the ice bath for 5 minutes. After 5 minutes, the tomatoes will have cooled and the skin will slip right off leaving you with a beautiful skinless tomato. Remove the core. Chop the tomatoes and add them to your bowl of chopped summer produce. When all of the vegetables and watermelon has been chopped, add about 1 teaspoon kosher salt and generously grind fresh black pepper. Stir well to combine. Drizzle 3 tablespoons of extra virgin olive oil and add 2 tablespoons sherry vinegar and stir. Let the flavors meld and sit on the kitchen counter for at least 1 hour, so the juices are extracted. You'll end up with this soupy concoction. if you are adding herbs, add them now. Once you have plenty of juice, stir it well again, cover with plastic wrap and place in the fridge overnight or at least 8 hours. In batches, blend the gazpacho until pureed, but still a little chunky. I blend a little more than half of the batch and leave the rest chunky so you can tell what is in it and enjoy the varied flavors and textures.In batches, blend the gazpacho until pureed, but still a little chunky. I blend a little more than half of the batch and leave the rest chunky so you can tell what is in it and enjoy the varied flavors and textures. Taste and adjust the seasonings, if desired--adding more lime juice, salt or herbs. To serve, top with diced tomato and watermelon and/or fresh herbs, Maldon salt, a drizzle of evoo and a splash of sherry vinegar.